Most Hyped Technologies: Self-Driving Cars, Self-Service Analytics, IoT; No More Big Data Buzz | What's The Big Data? 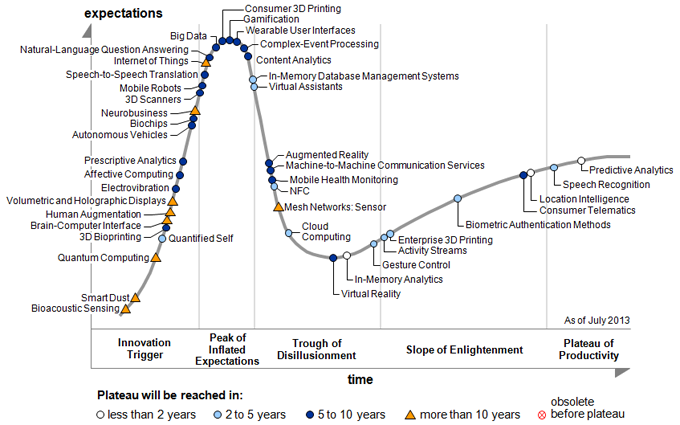 Gartner just released its 2015 Hype Cycle for Emerging Technologies report. It’s our most reliable buzz bellwether, annually defining what’s in and what’s out. 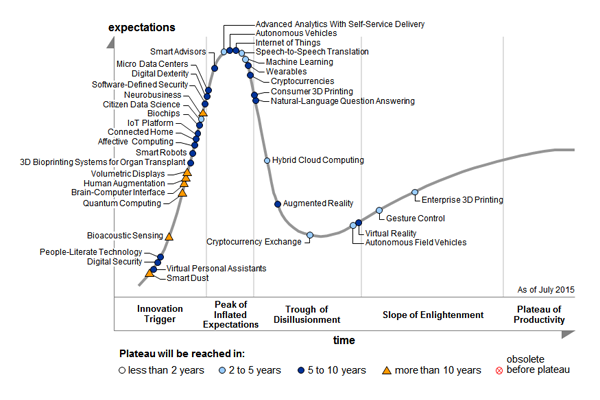 At the peak of inflated expectations just two years ago, Big Data was dethroned by the Internet of Things last year (but it was still estimated to be five to ten years from the Plateau of Productivity), only to completely disappear from Gartner’s hype radar this year (the 2010-2014 hype cycles are at the bottom of this post). Big data is out. So what’s in? The Internet of Things is still at the top of the list, with self-driving cars (“autonomous vehicles”) ascending from pre-peak to the peak of the hype cycle. But there is an intriguing new category—“advanced analytics with self-service delivery”—sharing with them top billing. I guess one could hype all three in one emerging technology package of “The Internet of Autonomous Vehicles Delivering Advanced Analytics“ as the solution to all our transportation problems. These technologies at the peak of the hype cycle also highlighted for me what’s missing from this year’s report. Given that the most hyped news out of Black Hat and Defcon conferences earlier this month were demonstrations of how to hack into cars (self-driving or not) and take control of them remotely, it is interesting that Gartner does not list any specific cybersecurity-related emerging technologies. It does mention, however, two general categories—“digital security” and “software-defined security” —both described as pre-peak, 5 to 10 years to the Plateau of Productivity. This may simply reflect the hype-less status of cybersecurity technologies. Given the daily news about data breaches, one could only hope that next year’s report will include some specific emerging solutions to what is promising to be a growing economic burden. Another emerging technology showing promise last year—data science—has disappeared from this year’s report. It is replaced by “citizen data science” which Gartner thinks, as it did regarding data science last year, is only 2 to 5 years from the plateau. This could turn out to be the most optimistic prediction in this year’s report. A related category—machine learning—is making its first appearance on the chart this year, but already past the peak of inflated expectations. A glaring omission here is “deep learning,” the new label for and the new generation of machine learning, and one of the most hyped emerging technologies of the past couple of years. The charts below show the evolution of Gartner’s crystal ball over the last five years and allow us to track the hype around Big Data over that period. It made its first appearance in August of 2011 as “‘Big data’ and extreme information processing and management” with 2 to 5 years to the Plateau of Productivity,then just made it into the Peak of Inflated Expectations in 2012, then rose to the top of most hyped technologies (together with consumer 3D printing and Gamification) in 2013, then started to descend into the Trough of Disillusionment in 2014, only to completely vanish in 2015. I guess Big Data is no longer an emerging technology. This entry was posted in Big Data Analytics and tagged analytics, Gartner, Iot, self-driving cars. Bookmark the permalink. 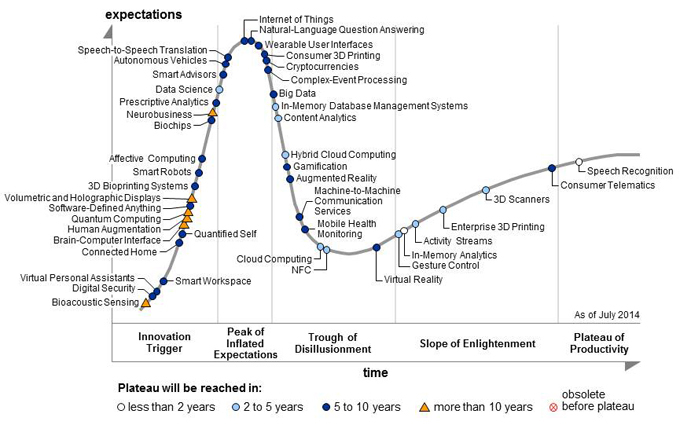 Pingback: 2017 Gartner Hype Cycle for Emerging Technologies: AI, AR/VR, Digital Platforms | What's The Big Data?